Auditorium and administration building for the Nobel Assembly at the medical university, Karolinska Institutet, in Stockholm. A long and instructive journey with dedicated clients – professors Lindsten, Bergström and Samuelsson. That the building should have brick facades like its surroundings at Karolinska Institute was taken as a given. With this as a point of departure, the entire building, both structure and façade, was built in brick. The facades are both cavity walls and solid two-brick walls. The intention on the exterior was to assimilate the building into its surroundings. However, for the attentive or to someone who often passes by the building, it soon becomes apparent that this building is of a different character than the adjacent laboratory buildings. 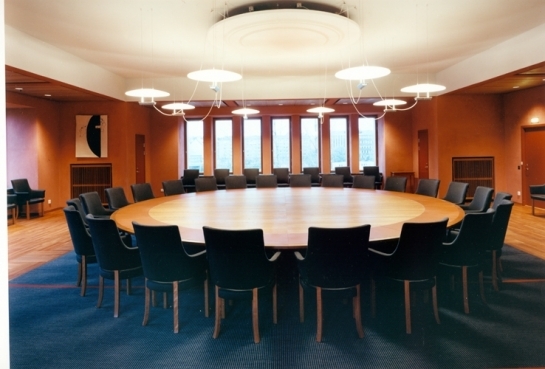 The program called for a building that provided spaces for the formal meetings of the Nobel Assembly, as well as the more everyday work between colleagues within and outside the Nobel sphere. At a time when public spaces easily acquire the character of a furniture showroom with the use of well-known designer furniture, we instead tested designing the furniture ourselves to create a careful but toned-down background to the interiors. Arkitektur No. 6, Stockholm 1991. Arkitektur No. 8, Stockholm 1993. Forum No. 2, Stockholm, 1994.